The HTC of Taiwan has started updating the HTC One X in Europe with Android 4.2.2 Jelly Bean. Moreover it has also been given the HTC's personlised Sense 5 UI. Users may note that the update is only for the HTC One X having Tegra 3 microprocessor which is codenamed Endeavour. The update is version No.4.18.401.2 and is a whopping 380MB downlaod as you can see from the image above. Therefore it is advised to proceed the updation process with a full battery and a Wi-Fi connection. The Qualcomm Snapdragon ones have not been issued a update as it is believed the the carrier AT & T is testing the update before releasing it to users. 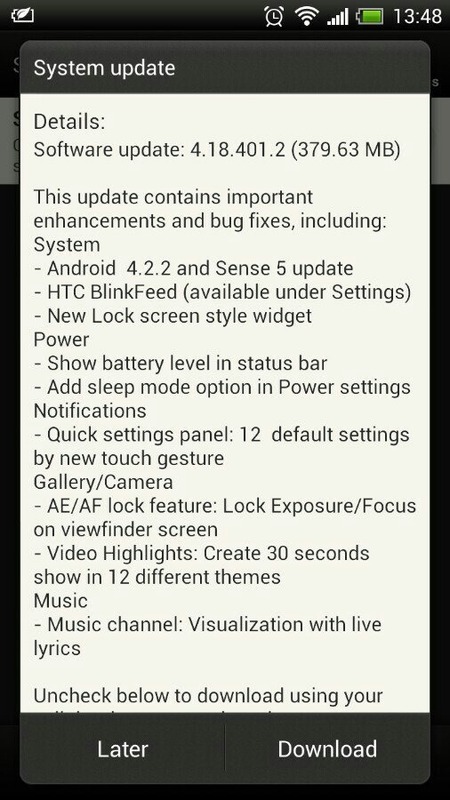 The update will bring HTC's Sense UI 5, BlickFeed, Quick Settings panel, Video Highlights and new camera features. You will also get a battery level indicator in the status bar and a new Lock Screen style widget. Once again the said update is only for HTC One X Tegra 3 (Codenamed Endeavour) smartphones only so if you have the Qualcomm one do wait for the HTC guys to launch update for your phone.